His obituary has been written and re-written. Time and again he has been counted out. His batting eye they said has disappeared. His feet, they mourned had given away. But John T. Wagner - Honus - fooled them all. He is out there on the ball lot every day at first base or third and National league pitchers are learning that the batting eye which was supposed to be gone is almost as bright as in former years. All of which recalls a statement Clark Griffith once made about batting eyes. "It isn't the batting eye that counts," Griff opined. "It's just the natural faculty of batting. 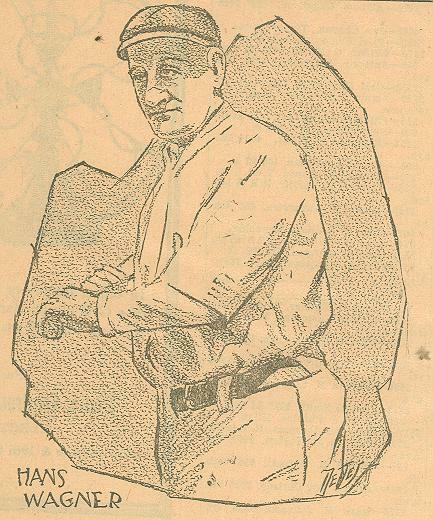 There was never a pitcher who could fool natural batters like Wagner, Lajoie, Cap Anson, Dan Brouthers or -d Delehanty. "Speed wouldn't stop them nor curves nor anything else a pitcher used. They would hit anything and they might go after a waste ball and hit it out of the lot, just as they would one in the groove." The statement was made when Griff was asked his opinion of why a smart ballplayer like George McBride could never learn to hit. "It isn't natural for McBride to hit and there are many like him, fellows like Scott of the Red Sox for instance. It is natural for some of the others." Then Griff made a startling statement. "I'll bet if Cap Anson or old Dan Brouthers could get someone to run to first for them they would bat better than .300 in either major league today." All of which is open to question., but which brings us back to the starting point - John T. Wagner. Honus is in the middle of his 21st season and he is hitting well above .300, which might be used as an arguement for Griff's statements. Originally published in the Rock Island Union, 1917.